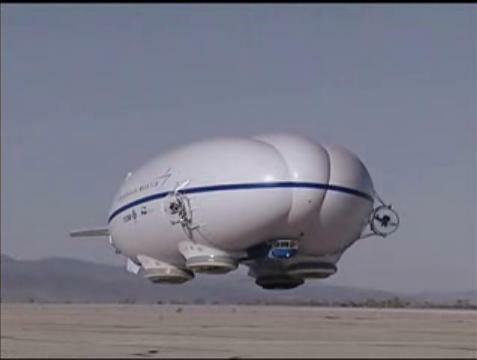 January 31, 2006 marked the maiden flight of the P-791 experimental hybrid airship. Developed by Lockheed Martin’s Advanced Development Programs aka Skunk Works, the P-791 hybrid airship was flight tested at Lockheed Martin’s flight test facility on the Palmdale Air Force Plant 42. The United States Department of Defense is interested in the development of an airship capable of transporting heavy loads, 500-1000 tons of cargo, up to 12,000 nautical miles. Such designs have been announced by DARPA ( Defense Advanced Research Projects Agency ). The Walrus HULA ( Hybrid Ultra Large Aircraft ) is an example of such an aircraft. A small scale version of the Walrus is scheduled to fly this year with a 40,000 pounds payload. Skunk Works managed to test fly the P-791 two years earlier. Although just a testbed for future development, P-791 successors can be used in the future for a number of applications such as delivery of fighting units in a theater of operations or as a weapons/sensor/communications platform capable of operating for long periods of time. The test flight was just a short traffic circuit around the Palmdale Air Force Plant 42 airport and Lockheed did not want to comment the flight. Airships have great potential for transporting cargo but their use has declined after a series of accidents, one of the most famous of which was the 1937 Hindenburg disaster. Another reason for their decline is the delicate ground handling and relatively high vulnerability to meteorological conditions.The P-791 is an independent research and development program initiated by Skunk Works to better understand the capabilities and to try to solve the numerous problems faced by operating large airships. A hybrid airship derives most of its lift by being filled with a lighter-than-air gas such as helium. Overall, it is heavier than air and gains the final 20% or so of lift by flying like an aircraft, but with slow takeoff and landing speeds that allow operations from short unprepared strips. One of the design features of the P-791 is the way the airship is built to gain span to produce lift: the entire construction is formed out of three pressurized lobes joined together. Four air cushions are placed on the outer lobes. These air cushions are used as landing gear and present a few advantages: the craft can taxi, land and take off in a conventional manner, pressure can be used to spread landing loads and also the flow can be reversed thus anchoring the craft to the ground to enable cargo loading and unloading in windy conditions. Four propellers are clearly visible on the craft, two at the tail and two on the sides that are capable of pivoting. It has been suggested that these are used to control the craft at low speeds. Another important aspect of the P-791 is the striking similarity with the British SkyKitten, called SkyCat. Both use the same concepts and there have been voices stating that the two programs were related. In any case, on January 31, 2006 Chief Test Pilot Eric P. Hansen flew for the first time this amazing hybrid airship prototype. Designed to be the best of two worlds by retaining the high speed of conventional aircraft and lifting capacity of aerostatic aircraft, critics say the hybrid airships represent the worst of both worlds in that such craft require a runway for take-off and landing, are difficult to control and protect on the ground, and have relatively poor aerodynamic performance. Up until now, no hybrid airship design has ever been developed past the initial experimental stages. Maybe the future will be brighter for the Skunk Works design. To give your buddy who is CEO of Lockheed $75,000,000,000 taxpayer dollars?????????????????????????????????????????????????????????? Read the article, the point is cargo lift. If this does make it past the experimental stage and travels 12000 nautical what kind of defensive tactics will this employ overseas. gouthro Do you really buy… I mean do you think the American people in its totality is stupid enough to believe this cover story. This is a HAARP/terror weapon/encroach on civil liberty WEAPON OF WAR against the American citizen. This is a hard asset of Domestic Terror of the NEW WORLD ORDER. No matter the comment or excuse there is no other use for such a device but prolonged lingering over the battlefield. Why don’t the army try to develop something like the VTOL we see in the game HALO. Even if it is a game it gave some good ideas on what future vehicles and air-crafts can be like. Believe it, this is no B.S. They ought to paint that sucker black, put flashing colored lights around the middle and fly it over Berkeley! such a lovely target!! !a blind man with an rpg can shoot that big fat bird down without sweat.. Does anyone know where I could get info on using the hybrid airship photo in a publication? Couldn’t find any contact info on this page. I think its a great idea. But I saw some very good points that some of the people posted before me. What are you going to do about camoflauging it?? I havent seen any anything about that at all. With something that size, you don’t bother trying to camoflauge. you bring the payload close to where it is needed but still in safe area… drop off the ten tanks or 20 APC’s or 2000 marines or whatever and they can drive/walk the rest of the way..
just looking at the specs and all it just sounds all to be to good as in yes you could use it as a full armoured transport or like a 4 times the capability of a spooky gunship for fire support but with modern SAMS and air to air missles it be big fire ball and all to waste . and im australian about to join the army and that looks like a few billion wasted on other technology , weapons or money to africa, or areas that are damaged by eath quakes recently. re. josh’s comment about it tuening into a fireball when hit by ordnance… modern airships are filled with low pressure, non-flammable helium – they do not burn nor do they burst. In one test a Skyship 600 was shot full of holes and was still able to stay aloft for two hours, complete it’s mission and land safely. Forget military use. This would be great to bring emergency aid supplies to places like inland Haiti where the roads are gone. The intention is to also deliver heavy loads to Canadas oil fields as it needs no runway and can land on just about anything. I would suggest you look at http://www.hybridairvehicles.net as this craft was developed by a UK commpany. If skunk get the contract then there could be some legal action taken. pointless if you ask me, a little wind and it flips, if used in battle 1 small arms shot could easily pierce it, and sooo expensive. Wow. Ok, low pressure non flammable gas… so what if it gets punctured? The Helium used in modern airships is kept LESS dense or at least comparably dense than the surrounding atmosphere. That would be the point of why an airship is lighter than air. So, if one were to be attacked by small arms fire, it would just keep on going as if nothing had happened. Larger munitions would have virtually nothing to hit on most of the surface of an airship, and they would have a good chance of sailing through the body of the thing without detonating against anything solid at all. As for wind flipping it, dude, you might want to read your old physics books. Lighter than air does not mean it has no weight. One of these things weighs up to hundreds of tons. It gets lift from the overall weight of the air it displaces. The bigger an airship is, the more it displaces and the more mass it can have before it loses lift. Also, this design is not lighter than air anyway, it displaces only about 80% or less of its weight using the lifting gas. Aerodynamic forces makes up for the 20% not compensated for by the gas. It flies a bit like a plane in other words. I would not get too excited about the P791 as it displays airship falling leaf stability problems, which mean they have not even got the basic stability issues that complicate hybrid airship design sorted yet. Falling leaf is a yaw roll interaction that can be seen on the clip of the final approach and landing (Looks like dutch roll for aircraft at altitude)and remember this was the best landing they could film in near perfect conditions. 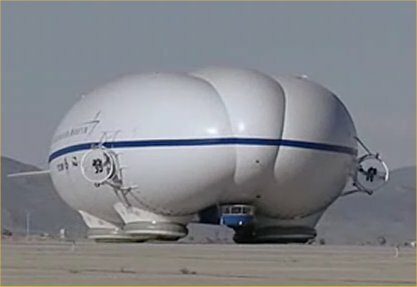 If LM get more funding from the US Army for the LEMV program it will result in a real white elephant of a blimp. Northrop Grumman chose Hybrid Air vehicles (HAV) in Cardington England because they are the only design team that knows how to get a Skycat hybrid airship to fly right. 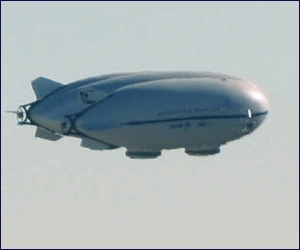 If you want to see more on modern blimps try http://www.airshipblimp.com or comedy site http://www.airship.me for a helium sniffing laugh. A lot of what sir David King says is true once a civil version of the HAV 304 hybrid airship is available from Hybrid Air Vehicles in Cardington, near Bedord England. Northrop Grumman and HAV have just won the 517 million dollar contract to build the LEMV for the US Army. This is the biggest initial manufacturing order for a prototype aircraft since the Harrier jump jet or Concord and it will change the face of aviation history, or as one reporter who looked at the design model flying said: this is not just going to be your grandmothers blimp. If you want to see more on modern airships, past, present and future see: http://www.airshipblimp.com or if you just want a helium sniffing laugh try http://www.airship.me the worlds only lighter than air comedy site, with lots of funny pictures and U tube links fit for all the family. If you look back at my last post saying how poor the aerodynamics were on the LM P791 and how good was the Hybrid air vehicles HAV 304 (Military Skycat version) the US Army seem to have the same opinion about HAV as Northrop Grumman did. Just after a week later they were awarded the LEMV contract. HAV will change avaition history in a new green manner that only the fuel supply companies and bad guys in various war zones will learn to dislike. Some of the best aviation designers in the world live in Blighty as the Concorde, Harrier jump jet and now Hybrid Air Vehicles have proven. No US company could design the Harrier, Concorde or HAV 304 to the same standard. To use one reporters comment when watching the Skycat demonstrator fly at Cardington: This is not going to be your grandmothers blimp. http://www.hybridblimp.net as hybrids are the way to go and I have 2 pages devoted to them. PS. http://www.airship.me will still work until next year. The US Navy flew airships from 1917 to 1962. Most of these were blimps, but the rigid types were of course the Shenandoah, Los Angeles, Akron, and Macon (all utilized helium as a lifting gas). This excellent platform can carry radar, electronic sensors, telescopes, scientists, cargo, passengers, and anything else a hell of a long way for relatively little money. Maybe the USN should get back into LTA. A surface ship is always a much better target. I hope the US Air Force contract also goes to Hybrid Air Vehicles and Northrop Grumman for a Skycat 20, as they are way ahead with the construction of the HAV 304 for the US Army and on schedule for first flight mid summer and on time deployment. Meantime Lockheed Martin seemed to have fired some of the P 791 dutch roll experts in their design team. PS. I wonder if Thomas Cook and Lufthansa who are the main owners of Condor charter airline will let the name be used for the HAV 304 as it does sound good. RPG? How about putting some CIWS for defense? or even smaller system such as those put in tanks (still experimental today)? Man portable air defence having no chance, being made of light material, I assume less metal and more plastic, and…probably stick with electric engine instead of jet. Slow and safe, probably. Buuut…better to use them as supply cargo for isolated region hit by disaster, 1000 tons of cargo? God Bless us, they would say. It is NOT easy to shoot down any LTA craft. Even when holed repeatedly it takes time for the lifting gas to leak out. Patching can be done on most of the exposed surface (bottom hemisphere). An RPG requires contact with a metallic or solid surface for triggering. It would never detonate hitting one of these. Besides, these craft are not intended for actual combat operations. They will either be used for transport, or high altitude operations. Hybrid systems allow for better ground handling. A neutrally buoyant LTA craft like a blimp or Zeppelin require a great deal of force to keep them on the ground and behaving in wind. A hybrid actually settles on the ground and with the landing cushions providing suction it stays stable in wind. A lot of times it’s difficult to get that “perfect balance” between user friendliness and visual appeal. I must say that you’ve done a excellent job with this. I appreciate the information in this article. It’s good, well-written along with easy to comprehend. You have got my attention on this subject. I will be back for even more enlightening articles. Hello There. I discovered your blog and this is an exceptionally well written post. I’ll bookmark it and return to discover more of your helpful info. Thank you for the post. I’ll really keep coming back. the components quite effectively and conveniently. allowed anywhere. Beyond that, however, doesn’t seem too impressed with such a satisfying result as this. They have been made 49 queries to database.